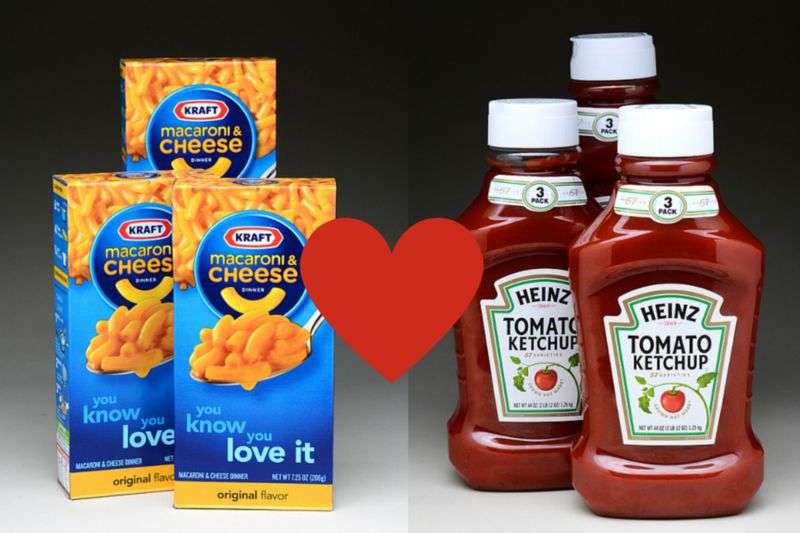 What the Kraft, Heinz Merger Means for "Real Food"
Look who’s getting hitched! A Washington Post article by Drew Harwell says it best: “A billion-dollar mega-marriage of sugary ketchup and processed cheese.” But as consumer demand has shifted over the years from highly processed to more natural, real food alternatives, what does this merger (now making it the 5th largest food company in the world) mean for the “real food” industry? For the purpose of this article, let’s define “real food” as the food your great, great grandmother would have eaten. While both Heinz and Kraft have organic food offerings as part of their portfolio, it doesn’t seem to be enough to compensate for their heavy reliance on the processed foods as their businesses’ “bread and butter.” In fact, organic food sales jumped 11% last year while Kraft’s earnings tanked. And while other large food companies also scramble to expand their natural and organic foods portfolio (in September General Mills announced it would buy Annie’s) we should expect Heinz/Kraft to continue to evolve to meet the increasing consumer demand of less processed and more natural foods, or see their earnings suffer. Despite large food companies throwing millions to defeat bills requiring GMO labeling, genetically modified ingredients are now part of the conversation when it comes to our food system. And although measures have passed and been defeated in many states around labeling, the precedent has been set and consumer demand is being heard. I predict that inevitably, legislation will require GMOs to be labeled, so sooner or later, Heinz/Kraft will need to label them or eliminate them from their products. As a result of consumer pressure, my vote is that they’ll start to remove these ingredients, and with the merger, if ingredient sourcing and manufacturing are combined it will be easier and cheaper to do so. Although both the Heinz and Kraft empires were build on the creation of food products (the opposite of farm to table philosophy) I’d expect that to evolve in the next decade. Not that we should plan to see them selling fruits and vegetables from a farm stand, but I do think we can expect more sustainable packaging, simpler snack products with fewer ingredients, and ingredients becoming more natural and less artificial. With their brands in 98% of American households, the products produced by these companies are American staples. But with people becoming more health conscious and the millennial generation coming to the table with an increased awareness of what’s on their plates, these brands have a lot to gain by adapting to current trends and healthy mindsets. As familiar household names, they’ve got a leg up on their competition to shift their positioning, speak the language of a more health savvy market with products today’s trend-setting consumers can identify with, and in doing so continue to maintain shelf space and market share in the American home. But if they choose not to make a healthier shift, they risk become the enemy of “real food” in the eyes of the consumers and go from the daily American staples company to the Friday night junk food provider. Many of us would love to see a reduction in food sweeteners all together, however, high fructose corn syrup is one of the most widely used and one of the worst offenders. HFCS, found not only in the super sweet dessert foods like cookies and soda where we’d expect to find it, also hides in things like Kraft macaroni and cheese and Heinz ketchup. As HFCS has been linked to obesity, heart disease, cancer, dementia, and more, even consumers who buy processed foods are becoming more mindful of the ingredients contained in them, and their future purchasing decisions will speak loudly and spark change from big food companies. Both companies have embraced (albeit reluctantly) the healthy food trends separately, and working together their economies of scale can have dramatic impact on not only the food we eat but the way it’s produced from a seed (or in a lab) to our stomachs. So what’s our role in all of this? Continuing to vote with our dollars, choosing real food, and demanding nutritious and healthy ingredients produced in sustainable ways while avoiding the over-processed alternatives cleverly pitched to us through high priced marketing campaigns. This Week's Dinner Just Got Easier. 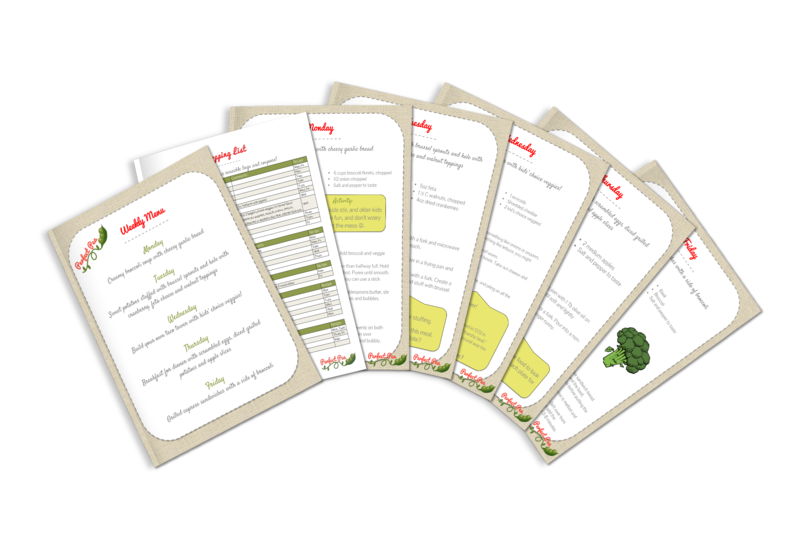 Get your FREE sample meal plan complete with a menu, shopping list, 5 delish recipes and kitchen activities for kids! Once upon a time there was a very busy, stressed and tired family who at the end of the day, wanted to think about anything other than what to make for dinner . . . read more. 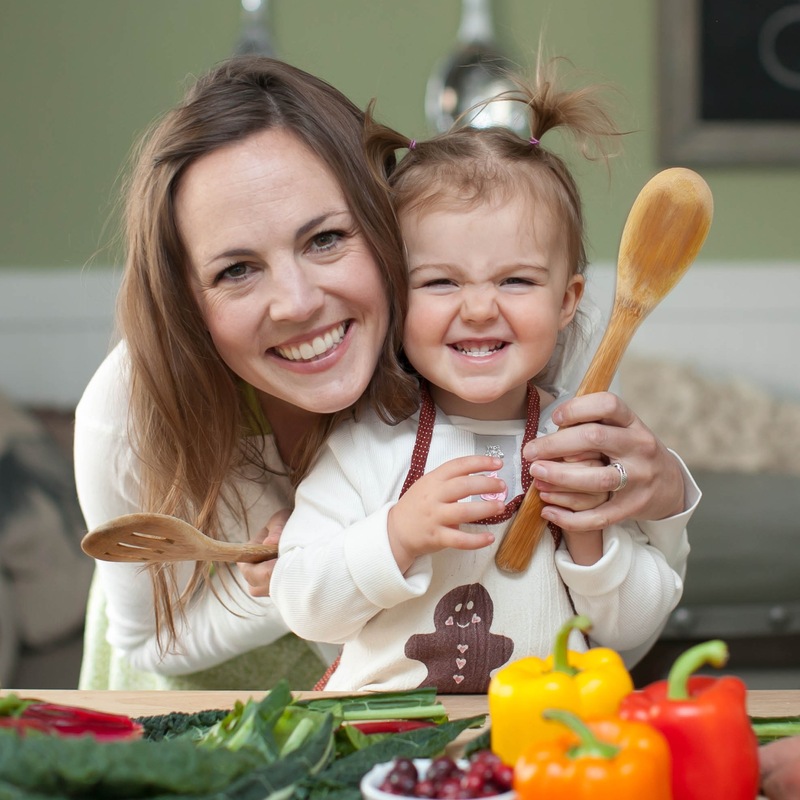 Health & happiness sent right to your inbox. 5 Fantastic Last Second Father’s Day Gifts (with Overnight Shipping). Yes! Perfect Pea is 1 Year Old!!! 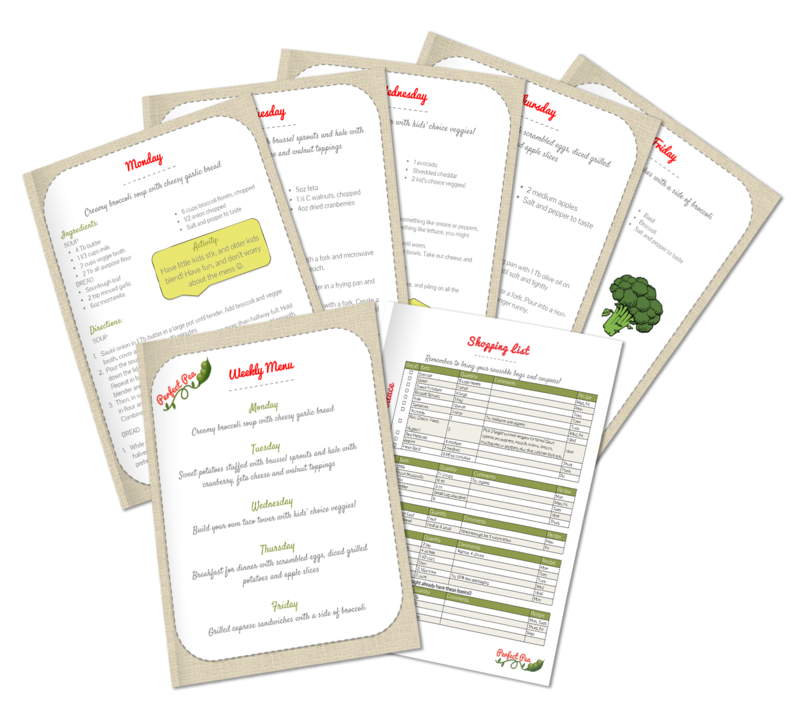 FREE Meal Plan & Activity Download! Summertime food & FUN sent right to your inbox.